Rohacell HERO is a low-density high compression strength foam core used for the manufacturing of aerostructures and high strength low weight components for aircraft. Rohacell Hero has been specifically designed for aircraft applications offering up to a 19% reduction in weight and 30% reduction in cost. Rohacell Hero is more robust than any other core material for aerostructure application and offers easy sight of damaged areas, very little water ingresses due to its bright white closed cell foam structure. Rohacell HERO is a recommended grade as a core material in sandwich structures for aircraft wings, landing gear doors, radomes, vertical and horizontal stabilisers, ailerons and other aerostructures affected by surface impact damage. Rohacell HERO has ultra-high compression strength compared to its density, making it the highest performing structural foam on the market for lightweight high strength applications. 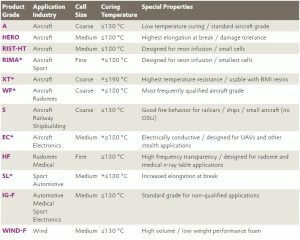 Evonik Industries German publish a comprehensive list of material properties, based on industry standard tests to give designers the figures they need to predicting potential mechanical stresses on an aircraft throughout its service life. Click here to see the Rohacell Hero datasheet. Rohacell is formulated specifically for each application to ensure the optimum properties of the final component are achieved. Rohacell HERO has a medium cell structure to ensure good bonding and shear strength between it and the resin infused reinforcement, but not so much to allow excessive resin to be soaked up into the open cells on the surface of the Rohacell core. It has a maximum cure temperature of ≤180 °C to allow even the most extreme curing and services temperatures for the components. Rohacell HERO has excellent elongation at break properties, which is important for withstanding the flexural loads experienced by the aircraft wings during turbulence. Compared to Rohacell S for example, also used for aircraft core sandwich components, but with a coarser cell structure for higher adhesion strength with the laminate and a lower curing temperature of ≤130 °C. Rohacell S has been specially formulated to provide enhanced fire resistance. See below for a list of the different types of Rohacell available and their properties. Figure 1: Shows a comparison chart of the Rohacell product range, specific properties and each product’s recommended industry applications. Rohacell is the highest compression strength core foam material available, which means a lower density Rohacell core foams can be used to achieve the same or better mechanical properties as an alternative structural foam. Rohacell has the unique ability to maintain it’s shape whilst being handled by the laminator, making it much easier to lay-up complex shapes. And it has a completely homogeneous structure, which means even pressure across the reinforcement when curing with high pressure in-autoclave methods. Rohacell is a closed cell structural foam which means uptake of resin is limited to the open cells on the surface, saving on both weight and cost of materials. Surface impact damage is an unfortunate and fairly common event for aircraft. Ranging from bird strikes, to random airborne debris from the runway on take-off and landing. Sometimes aircraft can become punctured by the debris causing the core material beneath to become exposed. Traditionally with honeycomb structures this would allow water and debris to creep into the laminate and not only become difficult to remove, but also potentially cause significant damage elsewhere in the component, through the freezing cycle of water. One major advantage of Rohacell HERO is it’s contrasting colour to the carbon fibre composite laminate. It’s brilliant white colour enables technicians to quickly and easily identify damage when inspecting the aircraft for surface impact damage. And because of Rohacell’s closed cell nature, it this protects the component from further ingress of water and debris, making it easier to clean and repair the area. 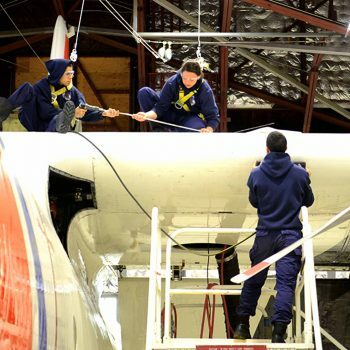 Saving both the time required to repair the wing and improving the overall lifespan of the aircraft and its components. 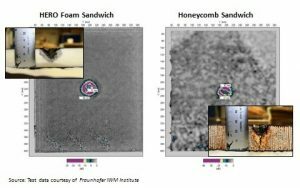 Figure 2: A controlled test showing the impact damage and further debris and water ingress of a sandwich structure made using Rohocell HERO (Left) and a Honey Comb core (right). Above shows a controlled surface impact comparison and the further ingress of water for a sandwich structure made using Rohacell HERO and another using a honeycomb core. Rohacell HERO shows some further ingress of water but remains localised to within 5-6mm of the impact zone. The honeycomb exhibits further water ingress down the channels in it’s structure through to the other side of the sandwich structure whilst also causing degradation and damage to the honeycomb on its way. Rohacell HERO is a recommended core material in sandwich structures for aircraft wings, landing gear doors, radomes, vertical and horizontal stabilisers, ailerons, flaps, elevators, rudders and other aerostructures requiring high performance core sandwich composites and also in areas where surface impact damage is an issue. It’s high strength compression strength and comparatively low density when compared to other products and its enhanced elongation at break properties lends itself to being the ‘go to’ choice for structurally integral components for aerostructures. We have a selection of machining partners depending on your requirements, high tolerance, low cost, multi-axial or a combination. 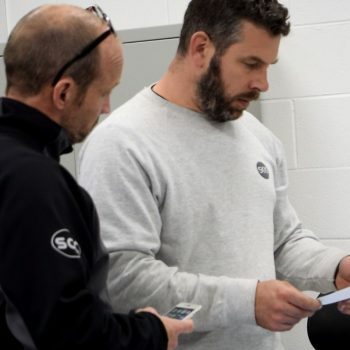 If you’d like a recommendation, like to use Rohacell HERO in one of your projects or looking for an experienced AS9100 accredited manufacture; click here to get in contact and we’d be more than happy to talk with you about your current or future projects.